--Exception: Diploma Frames & Custom Regalia may be shipped to Canada (additional fee). Orders will be shipped the most efficient way, either FedEx Ground or USPS Priority Mail. --If a PO Box is given, order will be shipped USPS. --APO addresses are shipped USPS. Shipping options: Choose 'Ground Shipping - Apparel & Gifts' - shipping fee automatically calculated based on order total. Orders usually ship the next business day. --Please note: Estimated total will include all items in shopping cart. 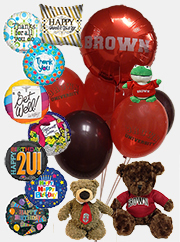 Merchandise with shipping included or no shipping, such as Diploma Frames or Gift Cards, is not counted toward order total once option is chosen. --If ordering all lightweight items shipping may be adjusted down to a lower level; lowest possible = $6.95. --If ordering Campus Shop merchandise and General Book(s), only option will be 'Ground Shipping - Apparel & Gifts + Book(s), but will be calculated the same way as Campus Shop. --Orders shipped to AK, HI, or PR $2.00 additional S&H; Will be shipped USPS Priority Mail. General order processing can take up to 48hrs. Friday afternoon and weekend orders will not ship out until Monday. -- FedEx Ground - varies depending on where the package is shipped. -- USPS - 2 to 5 day delivery time; extra day(s) to AK, HI, and PR. --A tracking number will be emailed to you after your order has been processed for shipping. --Add a message in ORDER COMMENTS during checkout and/or contact us directly at 401-863-2099. --If placing an OVERNIGHT express order after 12pm be sure to contact us by phone to ensure your order will be speedily processed. --Express order shipping and handling has to be priced individually once requested. --Overnight delivery is not available on the weeekends. Express Shipping Options available on request. Academic Regalia is shipped directly from the manufacturer. --Manufacturer's shipping and handling is $15.95 for purchased regalia. --Purchased Regalia: Allow 6 weeks for delivery as it is custom-made. Announcements are shipped directly from the manufacturer. --Allow 2-4 weeks for delivery. --Contact Balfour at 800-433-0296 if there is any problem with your announcement order. Chairs - $75.00 if shipped from bookstore; $45.00 if personalized chair. Decals, Lanyards & Stickers (only) - $4.00 shipping and handling; mailed via 1st Class Mail. --Please add a note in Order Comments is you want decals/stickers mailed. Diploma Frames are shipped directly from the manufacturer. --Flat shipping fee of $20.95 within USA; Int'l shipping to be determined. --Contact Church Hill at 800-477-9005 if damaged or defective. Gift Certificates (only) - No shipping and handling fee; email or pickup at store. LAMOU™ End Tables - Ship directly from manufacturer; please allow 2-3 weeks for delivery. Personalized Chairs - $45.00 shipping and handling; please allow 4-6 weeks for delivery. --Personalization is $25.00 per line; 32 characters max per line; 2 lines max. Promo Codes: Applies to stated merchandise only that is in stock; Does not apply to merchandise already discounted, on sale, or clearance priced; Discounts do not combine; Online orders only--choose Pickup at Store if you're in the area. Pick up at Store - Customer (in Ship To address) will be notified when order is ready to pickup. --If no contact information is available, please allow 1 business day before picking up order. --Book-Standard $5.00 - 5-7 days for delivery, ships USPS Media Mail. --Book-Priority $6.95 - 2-3 days for delivery, ships USPS Priority Mail. --$1.00 additional for each book to same address for either shipping option. --$1.00 additional handling fee for heavier/larger books. --Please Note: Campus Shop shipping fees, based on order total, apply if ordering General Book(s) and Campus Shop merchandise. --Technology Center merchandise is shipped FedEx Ground. --Delivery time is 5-7 days on average. --Special order & out of stock products can take an extra 2-5 days. --Textbooks and Medical Reference books will be shipped USPS or UPS. --1st Textbook/Medical Reference = $6.00; $1.00 more for each additional book.